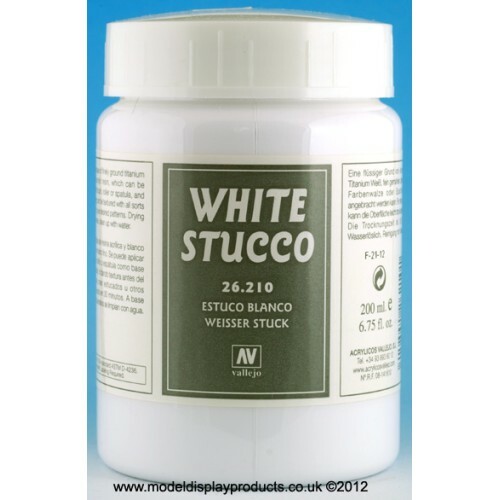 Fluid white base of finely ground titanium white and acrylic resin which can be applied with a brush, roller or spatula and before drying can be textured with all sorts of utensils to give desired patterns. Drying time 30 minutes, clean up with water. 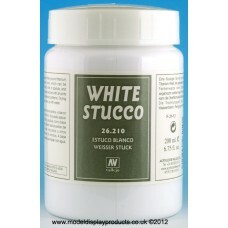 Still Water Val26230 200ml Vallejo Still Water is a water based polyurethane dispersion wh.. Foam & Snow Val26231 32ml A heavy extra opaque white acrylic, applied directly from th..
Water Effects – Transparent Water Val26201: 200ml A heavy bodied acrylic gel..
Water Effects Mediterranean Blue Val26202: 200ml A heavy bodied acrylic gel which can ..
Water Effects – Pacific Blue Val26203: 200ml A heavy bodied acryli..
Water Effects – Atlantic Blue Val26204: 200ml A heavy bodied acrylic gel which can be shap.. Extra Heavy Gel Val26535 200ml Extra heavy acrylic gel of the highest viscosity. It dries ..
Mat Gel Base Val26216 200ml A heavy bodied translucent medium it can be mixed with all col..
Mica Flake Gel Val 26579 200ml An Acrylic paste of natural mica which dries to a rough tex..
Oxide Paste Val26589 200ml A rust coloured, slightly gritty base, much more fluid and less..
White Stone Val26211 200ml High density acrylic of marble dust and titanium white, it can ..
Grey Pumice Val26213 200ml Very heavy coarse paste of natural pumice stone and acrylic res..
Black Lava Val26214 200ml Heavy paste of natural stone and black pigment used for rough te..
Sandy Paste Val26215 200ml A sand coloured, slightly gritty base, much more fluid and less..
Desert Sand Val26217 200ml A coloured, slightly gritty paste of acrylic resin pigment and ..